With trade deadline less than 24 hours away, will the Jazz make a move? As the clock ticks toward 1 p.m. Mountain Time on Thursday, the drama is heating up for the Utah Jazz. The Jazz are in multiple conversations around the league about acquiring talent to improve their team for the rest of the 2018-19 season and beyond, sources tell The Salt Lake Tribune. The focus remains on upgrading the guard and power forward positions, due to the expiring contracts of Ricky Rubio and Derrick Favors. That they’re facing an uncertain free agency period is a major impetus for the trade discussions. On Tuesday night, Tobias Harris, one of the possible free agent signings who Utah was interested in, was traded for the Philadelphia 76ers for a huge package which included two first-round picks (including a 2021 Miami unprotected pick, considered one of the better draft assets in the league) along with talented rookie Landry Shamet and Mike Muscala, among others. Harris will still be a free agent in the summer, but his trade to Philadelphia makes the 76ers the massive favorites in retaining his services. Meanwhile, it’s a relatively weak point guard market beyond Kyrie Irving and Kemba Walker, neither likely to be interested in signing with Utah. But Memphis isn’t giving up the point guard that has spent 11 seasons with the franchise easily. They’re interested in receiving multiple first-round picks in the deal, picks that the Jazz aren’t going to surrender without a fight. They’d also like young guard Dante Exum in the deal, but the Jazz like the 23-year-old, and still believe in his upside. The Salt Lake Tribune has not independently confirmed either report. Lowry was, Tribune sources say, a target of the Jazz’s in free agency two summers ago, but the Jazz opted to save their money to potentially resign Gordon Hayward. It’s unclear where the market stands for Conley at this time. 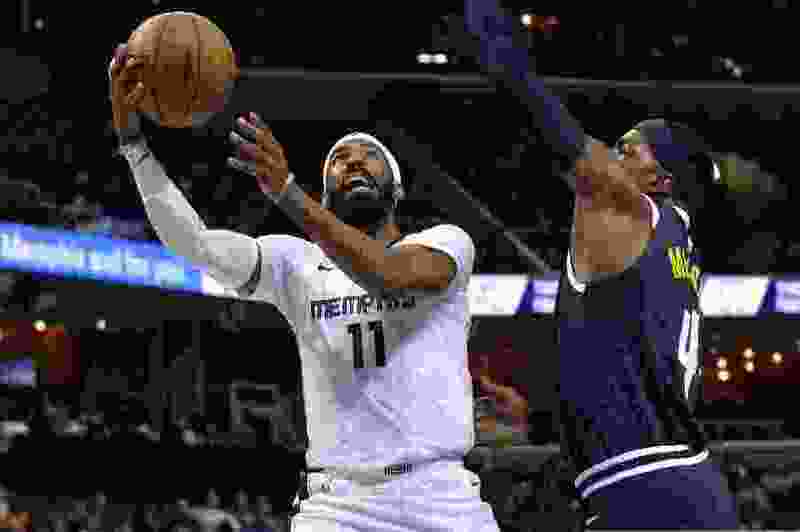 Vincent Ellis of the Detroit Free Press says that the Pistons “aren’t expecting to land Conley” at the moment. Besides Utah, they were the other team interested in Conley for much of the negotiation process. Sam Amick from The Athletic indicates that Indiana has added itself into the picture, too, while Candice Buckner indicates that Washington has also called Memphis. Elsewhere, The Ringer’s Kevin O’Connor mentioned Utah as one of four potential suitors for a Nikola Mirotic trade, along with Portland, Brooklyn and San Antonio. The Tribune has reported Utah’s interest in Mirotic in recent days, and Mirotic was held out of the Pelicans’ game against the Bulls on Wednesday night. There’s also the very real possibility that the Jazz complete a deal that hasn’t yet been rumored. That’s traditionally been their modus operandi, the kind of trade that earned them Donovan Mitchell, Rudy Gobert and Kyle Korver, among others. Washington’s Otto Porter had been a target of the Jazz’s, but he was traded on Wednesday evening to Chicago for two young players — Jabari Parker and Bobby Portis — along with a 2023 second-round pick. The Wizards also traded forward Markieff Morris and a second round pick to New Orleans for Wes Johnson, moving Washington under the luxury tax line. Those weren’t the only trades completed on Wednesday night. A three-team deal between Sacramento, Houston, and Cleveland saw former Jazzman Alec Burks sent to the Kings, while the Rockets sent Brandon Knight, Marquese Chriss and a protected first-round pick to Cleveland and a 2020 second-round pick to Sacramento. Cleveland also sent Nik Stauskas and Wade Baldwin IV to the Rockets. The Kings also agreed to a separate trade on Wednesday night, acquiring Harrison Barnes from the Dallas Mavericks in exchange for Justin Jackson and Zach Randolph. The trade makes Dallas a player in free agency, while getting additional talent to Sacramento as they try to push toward the playoffs. Before their game against the Jazz, the Phoenix Suns also acquired Tyler Johnson and Wayne Ellington from the Miami Heat in exchange for forward Ryan Anderson. Ellington is expected to be waived, making him an intriguing candidate for teams on the buyout market. Because they didn’t use it during the summer, the Jazz still could use their mid-level exception in that market, though they’d currently have to waive a player in order to do so.